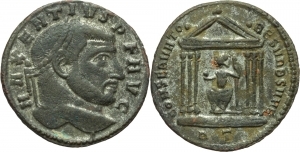 Lot 20556 - Maxentius (306-312). AE Follis, Rome mint, circa 307. Obv. MAXENTIVS P F AVG. Laureate head right. Rev. CONSERVATO-RES VRB SVAE. Roma seated right within tetrastyle temple; in exergue, RT. RIC 163. AE. g. 6.26 mm. 25.00 Good VF. Lot 20557 - Maxentius (306-312). AE Follis, Ostia mint, circa 309-312. Obv. IMP C MAXENTIVS P F AVG. Laureate head right. Rev. FIDES MILITVM AVG N. Fides standing facing, head left, holding standard in each hand; in exergue, MOSTT. RIC 45. AE. g. 6.11 mm. 26.00 Good VF.